Festa Italiana offers a myriad of authentic Italian experiences that will transport you from the heart of the Pacific to the boot of Europe. Pizza, pasta, wine, cheese, bread, gelato - all the most delicious dining delights seem to hail from Italy. Festa Italiana Hawaii will offer the opportunity to taste the many amazing flavors of Italy in one extraordinary evening in Honolulu's vibrant Kaka'ako District. Mangiamo! Michelangelo, da Vinci, Botticelli and the list goes on. Italy is as much accredited for its contribution to the arts as it is for its food. 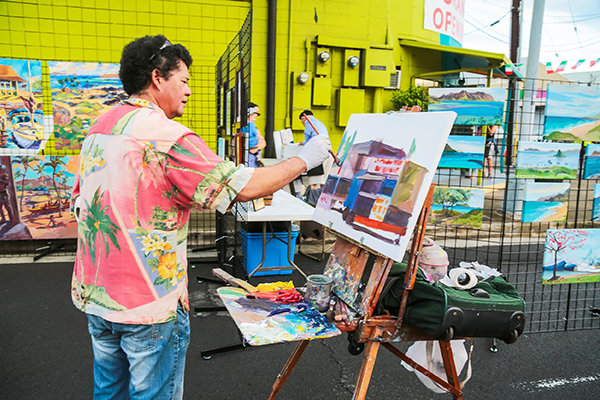 Festa Italiana Hawaii aims to bring to light this important aspect of Italian history and culture through showcasing the works of artists and musicians whose work is inspired by Italy. Italy is home to world-renowned art and undeniably delicious food and wine, but one must not forget that Italians love their cars. Festa Italiana Hawaii aims to showcase a selection of exceptional Italian cars well-known Italian car makers and provided by Velocity Honolulu - the home of Italian cars in Hawaii. the street festival event is FREE to the public. Festa Italiana Hawaii aims to provide Hawaii with a unique, immersive experience into the Italian culture through partnerships with local restaurants, vendors, artists, musicians and more who share a common love for Italy. Hawaii is a melting pot of cultures from around the world and despite being directly across the globe from Italy, the Aloha State is home to a respectable number of Italian citizens and Italian-Americans, not to mention thousands of general Italian (food + wine) enthusiasts. Have a look at Festa Italiana through the lens of one of our attendees!